I thought I'd test out this recipe when the children weren't home, as I can just imagine their faces if I suggested a dish featuring nettles. Well, actually I don't have to imagine it, as the expression on their father's when I told him what was for lunch today was probably a fair representation. But I persevered, anyway, adapting a recipe from the Fat of the Land blog for stinging nettle ravioli and sage butter. I simplified the filling, using just some soft goat cheese rather than ricotta, egg and parmesan. The trick with nettles is to blanch them for a minute, to neutralise the sting. After that, you squeeze out the water and can cut them up as you would spinach and mash them with the cheese and seasoning. I used some lasagne strips that I made with the pasta machine the other night. They're very narrow for lasagne, but seemed to be a good size for ravioli. The machine came with four little ravioli cutters, so it was just a case of piling the filling in small heaps on one strip of pasta, then wetting its matching strip, lining it up and pressing out the ravioli shapes with the cutter. 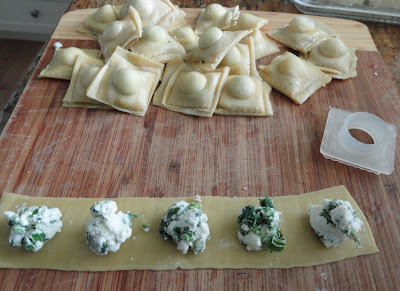 The resulting ravioli are a bit rustic-looking, but that doesn't bother me. They only take a minute or two to cook, and the simple sage butter sauce takes hardly any time. The nettles didn't have a strong flavour at all: the goat cheese was the main taste. I'm still not sure that the children would eat them, but I may have made a convert of their dad! When you say the nettles didn't have a strong flavour . . . apart from adding a bit of bulk and a bit of green . . . do they contribute to the dish or would it taste the same without them? I think they would have tasted the same. But I like to think that they contributed some nutritional value (and, of course, something worth blogging about...).